This weekend we traipsed across the state in our swagger wagon to spend some time with my husband's family, and celebrate our Uncle's installation as Commander of the Oregon VFW, at the coast. In order to shore up the costs, we all signed up for a meal and we ate at the beach house instead of ordering out or going to restaurants. I was going to make my old stand-by of Inside Out Manicotti when I ran across a recipe for BLT Pasta. I can't find the original one that sparked my interest, but I found several others online and they were all pretty much the same. How much easier can you get? Boil a pound (or two in our case of feeding a lot of people) rigatoni or another curly or ridged pasta so the bacon drippings have something to stick to, drain and rinse with cold water then place in a large bowl. In a skillet cook 12 slices of bacon until crispy, then remove the bacon to drain and spoon all of the drippings save for one tablespoon into a small bowl and set aside. Even though I doubled the amount of pasta, greens and tomatoes, I kept the amount of bacon the same. In that same skillet, place two heaping handfuls of chopped arugula, chard or another crisp and sturdy green and wilt it. Some have suggested spinach, but spinach has such a distinct flavor that's not a pepper green that I think it would make it a whole other dish and not the same as a BLT. Remove greens from skillet and add to the pasta bowl. Then, reusing the same skillet, add one to two pints of cherry or grape tomatoes (it said to quarter them, but I left them whole and cooked them until they burst a little bit) along with a tablespoon of the reserved drippings. Toss the heated tomatoes into the pasta bowl and season to taste with salt and pepper, adding enough of the bacon drippings that the pasta isn't dry. In my case, with two pounds of pasta, I used almost all of the rendered fat. For the first time making it, it was fine. I think next time I'd use more pepper, maybe a little bit of fresh basil, and definitely would crumble some feta or chevre over the top, or you could even add in some little pearls of mozzarella, but I think the salty creaminess of feta or chevre would be better. For an easy, summer evening dinner that's a classic with a twist, you should give this a shot. It's definitely one of those that you make to recipe the first time, then tweak it to make it your own. I just wanted to keep it as close to the simplicity of a BLT as possible, but without the creaminess of mayo on you bread, the cheese may just be the ticket to making it closer to the flavor and texture balance. It's another MotherTalk review! Click over to Knitty Reviews to read about Beside Still Waters by Tricia Goyer. It's 10:54pm and I'm sitting at the breakfast bar typing and watching Dexter. Now that I've called it that, I'm realizing that we never actually eat breakfast at it because it's too high and always covered in superfluous mail, a pile of books and whatever knitting project bag I've got going in addition to my laptop. But, back to the task at hand. Why am I perched on a barstool when I should be sleeping so that I can get more than four hours of sleep before my sweet little children awake pre-5am? Because I'm waiting for the last batch of cupcakes to come out of the oven so I can then wait for them to cool enough to take them out of the pan. In the morning we're packing up the party barge and heading to the coast for a weekend of fun with my husband's family, and to celebrate the huge honor of our uncle being installed as the Commander of the Oregon VFW. Since so much of the family was able to make it, it's also morphed into a reunion of sorts with a huge bbq on Sunday afternoon, and the celebration of summer birthdays. I love to make cupcakes. This weekend, I'm making two of my favorites; Magnolia's Vanilla Vanilla and a Chocolate Stout Cupcake that I made for Jared's birthday last year. The thing I love about family get together's is the time spent just chatting and relaxing; basking in the company of each other. I'm sure with the amount of people staying in the beach house, there will be at least one incident of hilarity and awkward tension, but that's part of the fun, right? Right? In hopes of enjoying as much open time as possible, I decided to bake the large batch of chocolate cupcakes tonight and take them along. On Sunday morning, I'll inject them with whipped cream (my first attempt, so I may only do it with a few) and ice them with a simple ganache. Basically, they'll be sophisticated ding dongs. Yum! 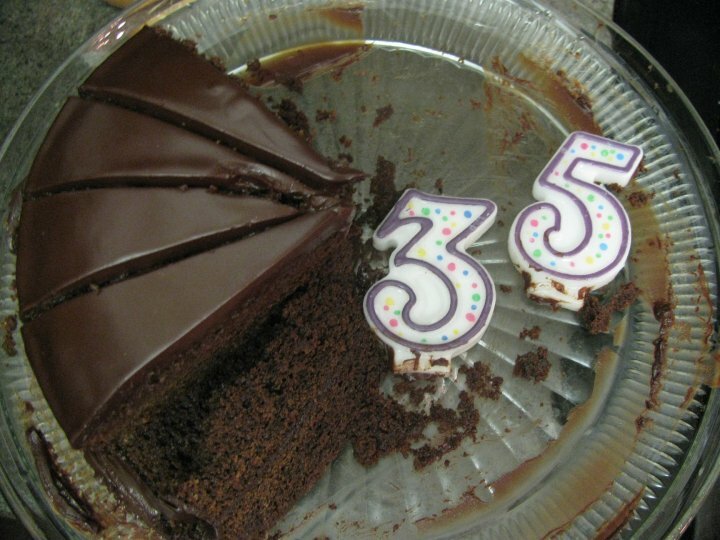 If you need a no-fail chocolate cake that's sure to wow (and gets better with each day as the flavors mellow) this is the one. With over four hundred reviews on epicurious, you're also bound to get a ton of great tips. It does make over 4 dozen cupcakes (I discarded the extra, as I didn't want more than 48 cupcakes!) so you can easily cut the recipe in half and have plenty. A quick tip for filling cupcake tins without a lot of mess is to fill a gallon sized freezer bag and snip the corner (or large pastry bag) and pipe it into the paper cups. Preheat oven to 350°F. Butter three 8-inch round cake pans with 2-inch-high sides. Line with parchment paper. Butter paper. 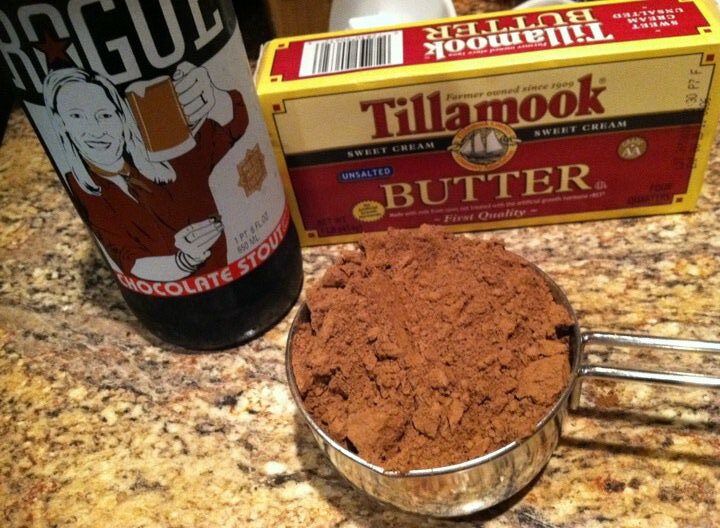 Bring 2 cups stout and 2 cups butter to simmer in heavy large saucepan over medium heat. Add cocoa powder and whisk until mixture is smooth. Cool slightly. Whisk flour, sugar, baking soda, and 1 1/2 teaspoons salt in large bowl to blend. Using electric mixer, beat eggs and sour cream in another large bowl to blend. 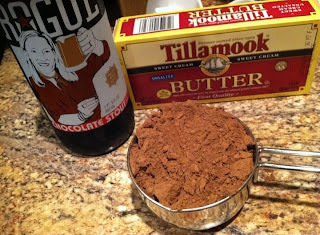 Add stout-chocolate mixture to egg mixture and beat just to combine. Add flour mixture and beat briefly on slow speed. Using rubber spatula, fold batter until completely combined. Divide batter equally among prepared pans. Bake cakes until tester inserted into center of cakes comes out clean, about 35 minutes. Transfer cakes to rack; cool 10 minutes. Turn cakes out onto rack and cool completely. (I made four dozen cupcakes, baked for 18 minutes). Bring cream to simmer in heavy medium saucepan. Remove from heat. Add chopped chocolate and whisk until melted and smooth. Refrigerate until icing is spreadable, stirring frequently, about 2 hours. Place 1 cake layer on plate. Spread 2/3 cup icing over. Top with second cake layer. Spread 2/3 cup icing over. Top with third cake layer. Spread remaining icing over top and sides of cake. I've made it through the first week of Operation: Follow the Meal Plan, and I've faithfully prepared the designated menu each day. Worried that I'd have a perpetual week one menu printed on the board, I set forth to find the following 2-3 weeks of meals and when Thursday came around, I erased that pane's worth of meals and filled them in for the following week. It has been such a great tool in not only making me feel organized, but also is proving to be a great reading practice for Henry. When he asks what the chef will be preparing later in the day, I direct him to the board and he has to sound it all out. He's able to read a lot more than I gave him credit for! It's also helping him to differentiate between colors, which is something he's struggled with. Which brings me to last night's menu. My kids have finally given up the ghost and learned to embrace the creamy goodness that is Mac and Cheese. How did I turn them on to this culinary delight? By pulling out the oldest trick in the book. Or is that box? As an adult, however, I've learned to truly enjoy homemade mac and cheese. Probably because it's made properly with whole milk, heavy cream and fantabulous cheese and spices. 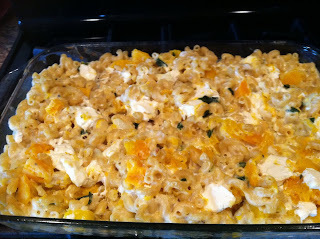 When we still lived in Massachusetts, I made Late Nite Kitchen's Butternut Squash Mac and Cheese and swooned. When I was flipping through my cookbook to meal plan, I found it again and slapped that baby in the queue. The goat cheese and sage marry nicely in the already cheesy and savory dish for a truly special treat. J and I had date night last night, but instead of caving and just making hot dogs or some other gross quick fix for the kids, I made the mac and cheese as planned. As I knew they'd already balk at the squash, I left off the bread crumb topping, but the bite I had (somebody has to make sure it's not poisonous, right?) was pretty darn good without it. I also omitted the bacon/pancetta because I'm pretty sure the baby-sitter is a vegetarian and I'd invited her to eat it as well. 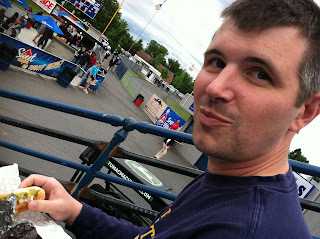 As an aside, in a true display of parental hypocricy, J and I had hot dogs for dinner at the baseball game. Before you read the recipe and think it's too much work, I took the following short-cut, which had this baby in the oven in less than 20 minutes, including chopping and prep. I omitted the bacon, but that wouldn't make a difference on prep time. The biggest thing I did was use a bag of frozen, organic, chunks of butternut squash, which I quickly sauteed with the onion (a Walla Walla sweet, naturally) and some garlic, after they were opaque, as opposed to roasting it in the oven. I had time to take an afternoon nap, wake up at 4:10, jump in the shower, put on my make-up that looks like I'm not wearing very much make-up, prep this dinner and get it in the oven before mopping my floors and washing all the interior windows like a made woman in time for the baby-sitter to get here at 6:00. And I still had 15 minutes to spare. The kids, thanks to J, were bathed and sitting at the table in time for me to scoop some dinner into their bowls, kids their little heads and fly out the door for a night on our own. You can always take a recipe that looks complicated or time consuming and take short-cuts that don't compromise healthfulness or flavor. Autumn Comfort Mac and Cheese - This recipe was created by Veronica Vadakan. 1. Preheat oven to 450°F. Toss butternut squash pieces with olive oil. Spread squash pieces in a single layer on a cookie sheet. Bake for 20 minutes, stirring once halfway. Remove when squash is tender and caramel brown. Set aside and reduce oven heat to 350°F. 2. Cook pasta according to directions for 'al dente.' Drain well. 3. On the stovetop, cook the pancetta (or bacon) over medium heat in a skillet for 6 minutes. Add shallots and cook 2 minutes more. Remove from heat. 4. In a 2 quart sauce pan, melt butter. Add flour and, stirring constantly, cook approximately 2 minutes or until golden brown. Add milk and cream in a slow, steady stream, whisking constantly until smooth. Add 2 cups of cheese and stir until melted. Remove from heat. Stir in 1-1/2 tablespoons of chopped sage. Add 1 teaspoon black pepper. 5. Mix cooked pasta, cheese sauce and pancetta together in a large bowl. Gently fold in roasted butternut squash and crumbled goat cheese. Pour into a lightly greased 9" x 13" baking pan. 6. Melt 1 tablespoon butter in the microwave in a large glass bowl. Stir in sage, cheese and panko crumbs. Sprinkle over the top of the pasta mixture in the pan. 7. Bake for 20-25 minutes or until cheese is bubbling. With a marathon behind me, I'm ready to turn some attention to a fun undertaking I've been thinking about for awhile. I'll be knitting up a storm this summer in order to expand my etsy shop. I took the first step the other day so now, when you're feeling super lazy, you can just type in sexandtheknitty.com because I'm an official domain name owner! If you've had a hankering for a special hand-knit item you'd like to commission, message me at my SallyHP Knits etsy shop and I'd be excited to get something going for you! I've hired a graphic designer to create a logo and banner for the shop, and we'll see where it goes from there. I will try to keep it as small as possible, because I definitely want it to remain something I enjoy rather than something I have to do, but I expect (read: hope) the holidays will be busy! Felted coin purse made for my niece for her high school graduation. Lined with a fun cotton print and over-sized button closure, it's my first labeled creation! We accomplished some big things in the back yard, with only a couple outdoors projects left. J primed the fence over the weekend, so it's ready to be stained. Turning my attention inside I finally got new dining chairs (good-bye rickety IKEA jobbies) and finished the reclaimed window that I cleaned up, poly'd and turned into a chalkboard menu planner. Remember the sad little dining area? My friend over at Recycled Love Letters featured it on her DIY tab. I love both her blog and Young House Love for getting great staging and renovation ideas. I've been obsessively culling all the catalogues that come in my mailbox which I'd previously have just recycled (especially Ballard Designs, Chia'sso and West Elm) for inspiration and have some great ideas to round out the dining room, sitting room and my bedroom. We separated the boys out, so we no longer have a play room, but I'm going to do a cool chalkboard area in each of their rooms. Hopefully bedtime will go more smoothly now! 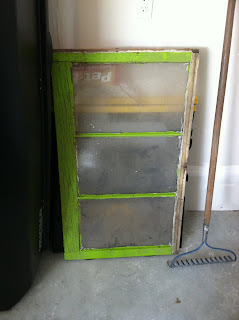 I cleaned the window well with glass cleaner and lightly brushed the dust and cobwebs off of the frame. 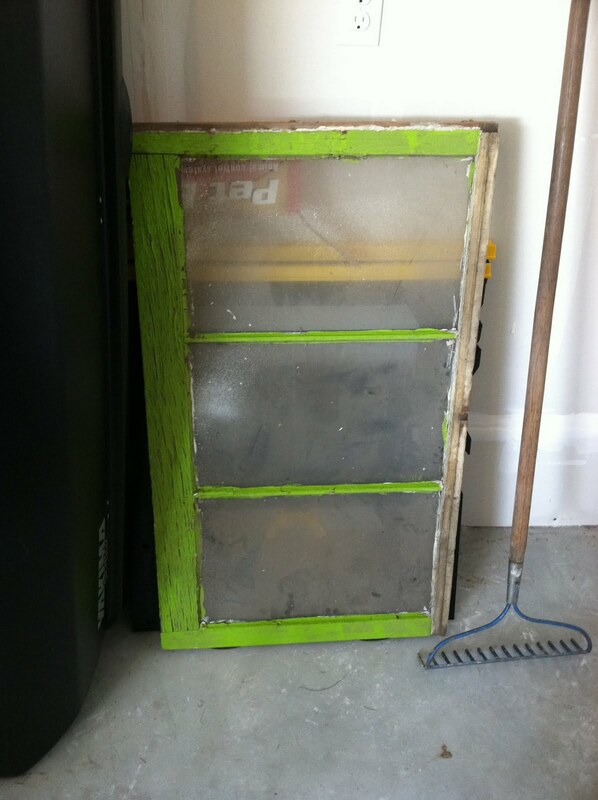 Can you believe I found it painted that awesome lime color?! Tape off the panes so that I didn't cover that pretty green with chalkboard paint, and then applied three coats of chalkboard paint. Take the tape off as soon as you're done applying the last coat. Together with my new chairs from World Market (Very sturdy and I love them! ), the dining area's coming together! And there you have it; A fun one-of-a-kind menu board for under $30. I wonder how much Pottery Barn or Sundance would charge for the same thing? Dying to hear how the marathon went? Click on over to my post on My Sole Sister to read all about it! Check out my review of the last installment of the Hunger Games trilogy, Mockingjay, over at Knitty Reviews.